I made some wooden knuckles. Why wood? Well, brass knuckles are usually made out of brass, which is a hard metal, and may hurt someone. Wooden knuckles use wood instead, and shouldn’t be as harmful, or dangerous, or heavy. Also, I may have a history of making safe/odd weapons. I also published this on Thingiverse, which means if you’ve got access to a laser cutter or are really handy saw, you can make your own. 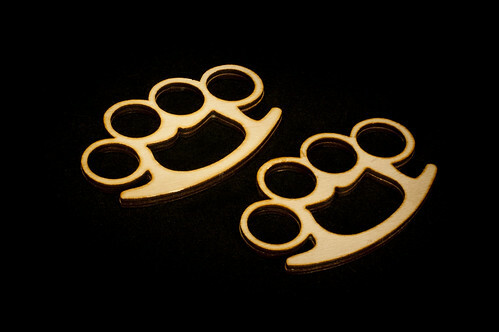 It’s derived from 3D printable “brass” knuckles which would look lovely in glow-in-the-dark ABS plastic. If you want to make your own laser-cut wooden knuckles, you could probably do so at the Milwaukee Makerspace if you were a member, and had some 3mm Baltic Birch plywood and a bit of glue. Posted on Sunday, April 22nd, 2012 at 12:56 pm. Subscribe to the comments feed. Both comments and pings are currently closed. Post on your own blog.